“San Francisco’s in a tough position” tells me the editor of a major American film magazine, at a festival reception in honour of Guy Maddin, or Werner Herzog, I can’t remember. His point, common wisdom among critics and industry alike, is that the festival is seasonally relegated to diminutive status by the eminence of Cannes, while domestically it faces new competition from the concurrent, ascending (and premier-grabbing) Tribeca Film Festival in New York, whose current director Peter Scarlett did prior, not to mention effective, duty as SFIFF’s artistic director. The news isn’t lost on new director Graham Leggat, (whose previous appointments included director of communications at the Film Society of Lincoln Center, and programmer of the New York Video Festival). Under Leggat’s nascent tenure, the festival appears to be in the midst of a makeover that feels more than cosmetic. The 49th edition was inevitably transitional, but consensus was that the sleeping giant had been prodded. With “First to 50” as its rallying cry, the festival’s impending golden anniversary (making it the oldest in the Americas) occasioned both a proud backward glance as well as a critical self-evaluation. In either case, it gave the festival a sense of purpose. A city of such cultural magnitude deserves a commensurate film festival, but just how to achieve this remains arguable. Whether remedial programs, such as the conception of SF360 – a joint online publishing venture with Indiewire designed to showcase the Bay Area film and media scene – can provide tangible solutions remains to be seen, but they at least appear to be opening the question to discussion. Since SFIFF is neither niche nor market driven, it eludes ardent cinephilic devotion as well as high profile buzz, and relies on a survey of international films that have proven their worth elsewhere. Without curatorial intent, this model too easily defines film festival as a kind of civic obligation, to be dutifully fulfilled in the interest of the audience. As these things go, one can easily get by on a cinematic diet that’s well-balanced, nutritious, tasty even, but for an insatiable cineaste, it’s all about stoking the appetite. As always, the proof is in the programming, and SFIFF’s line-up, while not striking out in any radically new direction, could scarcely be faulted for a lack of goods. I had caught a red-eye flight to the festival for the sake alone of catching Phillipe Garrel’s Les Amants réguliers (Regular Lovers, 2005). 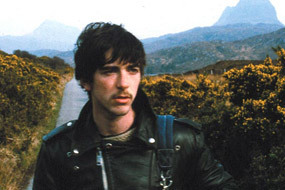 Since its Silver Lion at Venice in 2005, the film has garnered a host of critical accolades as well as put the obscure (what writer Stephan Grisseman deems “splendid isolation” (1)) Garrel on the map, so I won’t dote on it here, except to mention that Garrel’s lucid composure accommodates, no elevates, drifting states of consciousness. Although historically informed by the unrest of Parisian youth in 1968, Regular Lovers feels attuned to less exigent modes of behaviour; riots are requisitely aired, though as if in some protracted twilight, while Garrel’s concentrated, austere mise en scène more readily conjure his characters’ inutterable states of detached drug highs, blushes of overwhelming attraction, and helpless melancholy. Like Garrel’s film, Hou Hsiao-hsien’s Zui hao de shi guang (Three Times, 2005) bears the imprint of a master (in the cinemonde, one wonders if the distinction isn’t the equivalent of an unwanted tattoo), and I mention it here to acknowledge its inclusion in the program, but also to take note of how both films take an almost fetishistic approach to their pairs of actors. There are moments in Three Times when Shu Qi and Chang Chen threaten to overwhelm the film with their beauty, and the same could be said of Lovers’ Lilie (Clothilde Hesme) and François (Garrel fils Louis). Taken together, they’re all a good-looking bunch, as actors inevitably are, but it’s difficult to separate, say, Shu Qi’s appeal as a pool-hall siren from that of her eminent pop-culture image, just as Louis’ redoubling role (he played a nominally similar part in Bertolucci’s The Dreamers  and is the director’s son), adds a reflexive aspect to his performance. Any “fetishistic” aspect, then, seen in this context, seems less gratuitous and more deliberate, a means by which the director innumerates his actor’s signifying power – though not at the expense of dramatic logic. It was this dynamic that kept both Garrel’s and Hou’s historic evocations, however exquisitely rendered, decidedly in the present. Speaking of lovers, the festival’s French selection had its share, none so glacially portrayed as those in Nobuhiro Suwa’s Un Couple parfait (A Perfect Couple, 2005). Suwa is Japanese (as a director, some might say distinctly Japanese), though with A Perfect Couple he’s shooting in France, with French actors (Valeria Bruni-Tedeschi and Bruno Todeschini, both great). The film charts, in static, real time takes, the dissolution of a couple’s marriage as they travel to Paris to attend a wedding. Ensconsed in a hotel, the shades drawn and beds separated, the increasingly embittered couple retreat into their respective emotional corners, and come out to fight when the mood ever-so-slightly moves them. She steps out to gaze at the archaic torsos in the Rodin museum; he cavorts with another woman in a nearby cafe. Not much more happens, save for a dinner out in which they announce to their guests their intent to separate. Prototypically minimalist, Suwa’s film is drained of any affective content (likewise, Caroline Champetier’s cinematography leaches the film of colour and light): what we see is immovable, how we see it is subject to revision. When it seems that this couple’s relationship is forsaken, their lingering parting embrace goes against the film’s seemingly misanthropic grain. Lovers of an entirely more passionate persuasion (although they too spend an inordinate amount of time locked away in a Paris hotel room) occupy Backstage (2005), Emmanuelle Bercot’s study of idolatry as mutually parasitic relationship. Icy pop diva Lauren (Emmanuelle Seigner, channeling Debbie Harry and Mylène Farmer in equal measure) enters the life of teenage fan Lucie (Isilde le Besco, in what should be considered a “break-out” performance, already) literally through the front door; a shameless publicity stunt takes Lauren to the unsuspecting fan’s home, film crew in tow, to shoot a video as a birthday “gift” to the young fan. This opening sequence unfolds in a surreal fog: Lauren’s oversized aura crashing a typical suburban home; Lucie’s near-violent reaction to her fantasy coming palpably true. Indelibly marked by the encounter, Lucie ventures to Paris to stake out the star’s hotel room, craftily insinuating herself into Lauren’s orbit (itself a rather wrecked cosmology of stardom). Lucie graduates from dumbstruck wallflower to personal assistant, from emotional confidante to eventual surrogate. Bercot mines their relationship for all its dominant/submissive implications, but more insightfully exposes the needs that give rise to hierarchies, both cultural and personal. Less a critique of starfuck mentality than an immersion in it, Backstage benefits from its imperceptible fusion of farce and melodrama. 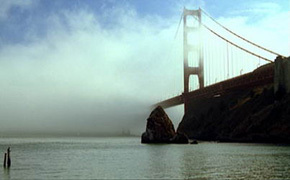 No film courted controversy as much as The Bridge (2005), Eric Steel’s documentary about the mythic allure of the Golden Gate bridge as the world’s top suicide destination. As premises go, this was enticing enough. With no prior knowledge of the film, save for its stark poster, I was emotionally anticipating something akin to James Benning’s real-time studies of place, or photographer Richard Misrach’s Rothko-esque portaits of the bridge’s (sadly) iconic power. Real-time it was: training cameras on the bridge for most of 2004, Steel and his crew illicitly captured nearly all of the twenty four suicides in that year. What prompts more incredulity than the spectacle of bodies flailing to their deaths, however, is the parade of talking heads that Steel interjects throughout. With due respect, these are friends and relatives of the deceased, commenting on their dear departed; but as I understood it, knowledge of Steel’s footage was not disclosed to them at the time of interview. Moreover, what strikes me as most specious is Steel’s use of his subject’s actual deaths as a dramatic device shuffled within his narrative. Thus, the film’s darkest horse, a long-haired, black clad phantom named Gene, glimpsed throughout the film pacing the span of the bridge, is saved for the final flight. Thus staged, one can’t help but feel that Steel’s documentation is nothing more than a spectacle, and that his unwitting subject at least had some intuitive sense to make it spectacular. The film, in spite of its dubious methodology, was ultimately haunting for the physical proximity of its prime object – the bridge is inescapable from most city views, and a constant reminder of the spirit that moves many to end their lives. Dismissed as shamelessly exploitive or lauded as pre-emptively humane, The Bridge implicates the viewer in its agenda in problematic but uninstructive ways. I felt that silence was my only means of resistance. Which is what makes Philip Groening’s 164-minute immersion into Carthusian monasticism – the epitome of hermeticism – so expansive and eventually rewarding. Die Große Stille (Into Great Silence, 2005) is not easily endured (I first saw it quite early in the morning, in an inexplicably cold theatre in January at Sundance), but that seems partly by design. Whether you can identify at all with these monks and their imposed way of life, the film itself becomes an occasion for meditation (with intermittent naps for good measure). If the essence of prayer is ultimately incommunicable, not least by film, the act of devotion in its ritual manifestations assumes a surprisingly relatable dimension here; this is work and play by other means. Michael Glawogger’s paean to global labour, Workingman’s Death (2005) is possesed of a similarly grand vision, and not without its own mythic intimations. The film has received deservedly ample coverage, and I single it out here as a contrast to The Bridge’s relation of director/subject. How does Glawogger’s desire to make visible the intense labour of other persons affect those persons? Inhabiting the very spaces of his subjects, does Glawogger and his crew, by not directly sharing in their work, allay or excacerbate the physical hardships of these labourers? Do his records of them dignify, or merely astheticise? My feeling is that the purity of Glawogger’s intent and the intimacy of its execution serve to extend, not diminish, the available air of these workers. 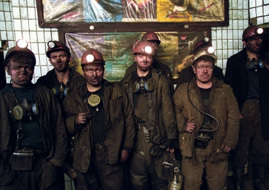 Technically bravura filmmaking, Workingman’s Death won the Golden Gate award for documentary, and begged the question of why Glawogger’s latest feature, Slumming (2006), was not included in the program – it would’ve been a coup. I was a little remiss on SFIFF’s new Kinotek program, a series devoted to the “ways new technological platforms produce new aesthetic and narrative forms, affect existing ideas of media production, distribution and exhibition, and create new relations with and among their audiences.” Theoretically sound, this programming stream alluded mostly to the works of cell phones as movie camers, VJs remixing existing film clips to newly generated (and highly danceable) scores, machinima – or CGI built from the 3D engines of video games, and “live cinema” practitioners. It will be interesting to see if such rubric is prescient or gets subsumed by the tail-eating appetite of its own spawned culture. So often, new technological platforms are host to conceptually rudimentary content, while the most trangressive of notions turns up, practically unwilled, in the backwaters of old-fashioned movies (this may perhaps account for the current appeal of Apichatpong Weerasethakul [Sud Pralad/Tropical Malady, 2004]). Still, Kinotek occasioned the dissemination of the theatre and the mobilisation of the audience, which was essentially SFIFF’s way of taking it to the streets. Whether this meant a few dozen folks hunkering down in a bar over a laptop and a projection screen, like some zeitgeist version of an old super-8 film club in the garage, or hundreds of festival goers convening on a dance floor while Addictive TV, forerunners of the video-mixing scene, mashed up movies like some beautifully malfunctioning Avid suite, the message was the medium. As the crowd eventually thinned, Leggat and company could be seen working their moves well into the night. Was this display of vitality reason alone to put SFIFF on your dance card for next year? I’ll continue to go for the movies, in the hopes that SFIFF’s current incarnation can program more to define where cinema is going than where it’s been, even if that means looking to Bucharest before BlackBerrys. Stefan Grissemann, “History is the Enemy of Art”, Cinema Scope, winter 2006, p. 29.